I had been meaning to get into this series for a while it seemed to be everywhere- Youtube, Goodreads, like it was waving at me telling me I was missing out on something awesome what I listen, er no. Somehow I was still not convinced and City of Bones made it onto my, I will read it at some point probably (but probably not) list. Then came the movie… it was, as most people know hailed to be the new Twilight, Hunger Games, Harry Potter type franchise but like so many Young Adult book to movie adaptations was a big old flop. Now I saw this movie, and while it was a C- at best I couldn’t help but think Hmm… I bet this is just a really shoddy adaptation of a really good book. It was like I could see the book screaming with in the walls of this movie that had clearly been marketed at the Tweens and the movie makers had given much regard to the content. So thanks to dodgy directing and a Demi Lovato song that still begs the question WHY I bought City of Bones. City of Bones is about fifteen year old Clary Fray who, when visiting a club with best friend Simon sees, what she thinks is a murder. What she is actually seeing is the half human half angel beings called Shadow Hunters killing a demon. Shadow Hunters can not be seen by regular humans or Mundanes. So when Clary sees the Shadow Hunters are as shocked as Clary and start to wonder who this Mundane girl is. Soon after Clary meets her first Shadow Hunters – including the mysterious Jace Wayland her mother is kidnapped, and a serious of events unfolds that will change her life and her friends and families lives forever. 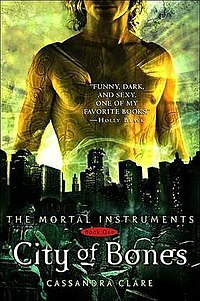 I loved this book, I am currently reading book two City of Ashes which is just as gripping if not more so. The characters are so well developed and I constantly find myself laughing out loud which I love. The Shadow Hunter world is a world that I truly get lost in and I know that I am going to devour this series in no time. Bring on book three – City of Glass! This entry was posted in Book review and tagged book review, Cassandra Clare, Clary, fantasy, Fantasy Fiction, fiction, Jace, Shadow Hunters, The Mortal Instruments, TMI, YA, young adult on February 25, 2014 by Chloe.